(Venice, Italy) Power. Glory. Wealth. The sheer magnificence of the Great Council Chamber inside Palazzo Ducale is overwhelming. 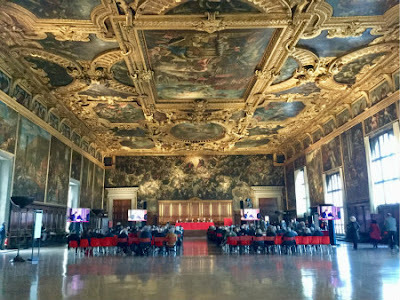 The immense hall was where the noblemen of the Great Council of the Venetian Republic convened, the 1,000 to 2,000 aristocrats who composed the most important political body of Venice and who were the guardians of the laws of State. The Great Council met for the first time in the Sala del Maggior Consiglio in 1423. After a fire on December 20, 1577, the structural damage was quickly restored and the gilded room was decorated by the greatest artists of the time, such as Veronese, Palma il Giovane, Francesco Bassano and Jacopo and Domenico Tintoretto, whose gigantic Il Paradiso is one of the world's largest paintings. On the walls, historic battles and triumphs bombard the eyes with the glorification of Venice. Portraits of the first 76 Doges run in the frieze under the ceiling. 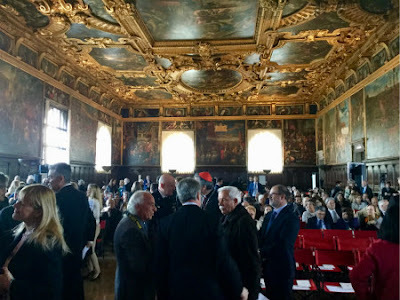 Yesterday, April 13, 2019, nearly 600 years after the Great Council first met in the Sala del Maggior, a conference was held here to discuss the fate of an even more ancient Venetian structure: "San Marco - The Basilica in the Third Millennium." With the Tintoretto Il Paradiso as the backdrop, the setting for the conference shows the importance that Venice still places today on the condition of St. Mark's Basilica, which was first built in 832, rebuilt in 978 after it was burned in a rebellion, and whose current structure was consecrated on October 8, 1094. When you've got sacred architecture still standing for nearly a thousand years, the challenges that Venice will face far in the future, in the Basilica's third millennium, are not taken lightly. 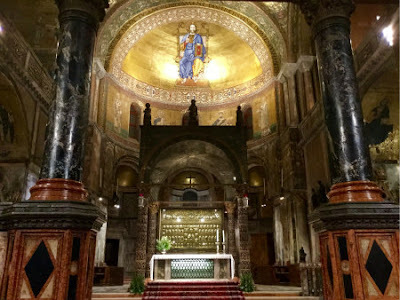 "Nowhere in the Western world, not in Ravenna or Aachen or even in Rome itself, had so sumptuous a monument been raised to the Christian God..."
"La Basilica di San Marco di Venezia. Arte, storia, conservazione," a beautiful three-volume book published by Marsilio, was presented at the conference. It includes essays by more than 60 different experts written in a language accessible to a wide audience about "the splendor of a basilica suspended halfway between East and West which contains priceless treasures of faith and art." With images that peek into the most secret corners of the Basilica, the book covers the history of thirty years of restorations, and is also a starting point for new ideas. The office of the Procurator, whose duties were to attend to St. Mark's Basilica, was established in the ninth century. These days the Procurators are still in charge of administering the Basilica under the authority of the Patriarch of Venice. Carlo Aoberto Tesserin, the highest Procurator, was on the opening panel, as was Mons. Francesco Moraglia, the Patriarch of Venice, as well as representatives from the State -- Luigi Brugnaro, Venice's mayor, Gianluca Forcolin, the Vice-President of the Veneto Region, and Vincenzo Zoccano, the Undersecretary of State. Climate change and the increasing frequency of acqua alta (high water) is one of the greatest challenges that the conservation of the Basilica faces. Another is mass tourism. In 2018, a whopping 5.5 million visitors entered the Basilica. Zoccano said, "Politics cannot divide such important issues. The government wants to be close to the Venetians and their city, which is a world heritage. We will not draw back from this responsibility." They also want to make it easier for private donations to receive greater tax deductions. 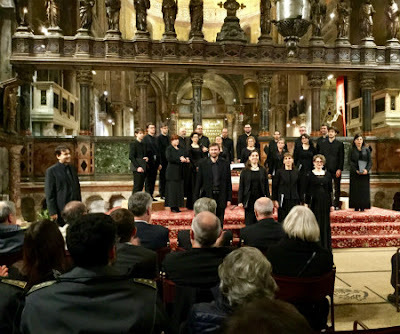 On the evening before Palm Sunday, the voices of the chorus filled the Basilica with the music of the angels. The Pala D'Oro beamed its golden wisdom. The mosaics on the walls and the domes and the apses whispered their ancient stories. The deep spirituality of the Republic of Venice washed over me, and lifted my spirits. Afterwards, I said to a Venetian friend, "I feel... clean." "Purified," she replied in English. "Yes. Purified is the word." 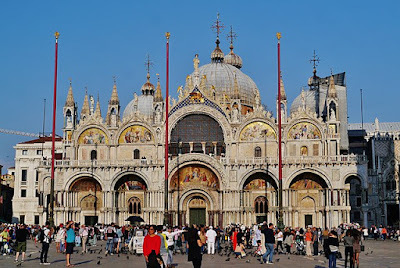 For the sake of the planet, the Basilica of San Marco must prepare for its Third Millennium.